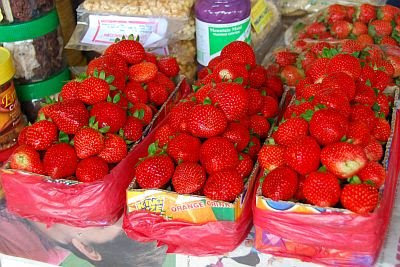 Strawberries are one of the most popular Baguio pasalubong besides ube jam from Good Shepherds and peanut brittle. One of the more popular "things to do in Baguio" is picking strawberries at the Strawberry Farm in Baguio's neighboring town of La Trinidad. Tutubi wanted to visit the farm again after so many years but due to the grueling schedule of the convention, he begged off at the last minute and decided to wake up late than join the free trip to the farm offered by a convention sponsor. Just before going back to Manila, Tutubi and his friends stopped by a stall near Kennon road selling fresh strawberries at PhP100.00. Tutubi just bought a kilo and selected not so ripe ones since it's not for immediate consumption plus the danger of "beaten black and blue" strawberries due to travel from Baguio to Manila. He also hand-carried the strawberries instead of stuffing them in his bags to avoid damage. After just a few minutes in Manila, the strawberries were consumed in no time at all! If Baguio celebrates the Panagbenga Festival in February, Benguet has the Adivay Festival scheduled in October annually. Commute to La Trinidad from From Baguio City: board jeepneys going to La Trinidad on Gen. Luna near the University of Baguio. Request the driver to drop you off at the Strawberry Farm. You need to cross the road plus a little flexing of your leg muscles to get to the Strawberry farm for your strawberry picking "adventure." Driving Directions to La Trinidad From Baguio: From Session Road, head towards Magsaysay Road where you'll pass by Bell Church and La Trinidad welcome arch. The strawberry farm is about six kilometers from the welcome arch and look for street signs to the farm to turn left. At the entrance of the farm are the usual stalls, souvenir shops and hawkers selling their wares and mostly "strawberry-powered" delicacies. 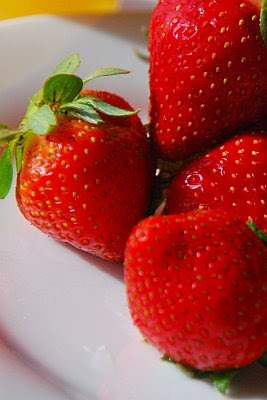 The common strawberry varieties grown in Benguet are the Sweet Charlie from Argentina, the Festival and Camarosa from California in the United States, and the Toyonaka and Haronoka from Japan. Organic planting method also use predator mites to help eliminate spider mites, a major pest that destroys strawberry flowers and leaves. these strawberries look so good. i think i may need some whipped cream to go with them. We're looking for someone who can help document the building of the Philippines' Pacific Rim Friendship Park. Briefly, we like to describe the activity as Survivor-Meets-Habitat-for-Humanity. The idea is to bring together architecture and art students from different parts of the world who, together with counterpart Filipino students, will design and build a Friendship Park under the artistic supervision of leading artists, architects and urban planners - all in 30 days. Puerto Princesa City is providing the land. You can view the spectacular site they are allocating here: http://lookingforjuan.blogspot.com/2008/04/its-decided-more-on-our-pacific-rim.html. Students from the US, Russia, Mexico, Japan, China and Korea will start arriving on May 2 and 3. We'll give them a tour of Manila on May 4. Then on May 5, they all fly off to Palawan to build the park. If all goes well, we will launch the park on May 30. At that time too, we will also have an outdoor banner exhibit at the new park. So... we're looking for someone who can go with the group for the entire period from may 2-31 to take photos (or better, photos and videos), document, and blog at least once every day from May 2-31, 2009. He/she will also of course be expected to help with the building of the design - but his/her main responsibility is the documentation, photography/videography and blogging. He/she can interview the participants, talk about anything interesting during the whole process (new friendships, tensions, etc), and maybe even highlight Palawan and the Philippines as a must-see destination. Lots of room for creativity, meeting new people, and learning about new cultures. Ah, and the perks: we will cover his/her plane fare from Manila to Puerto Princesa and back, hotel stay (here in Manila and in Palawan), board and lodging for the entire month, and a MINIMAL stipend (at least P10k, maybe a bit more if we can secure additional funds). We can practically guarantee that he/she will make new and lasting friendships (maybe more - who knows? ), and definitely, he/she will have a unique entry in his/her CV once this is over. We may be able to lend a laptop and we can figure out internet access requirements later. Otherwise, he/she should have their own equipment (camera, lens, tripod at a minimum). Preferably he/she would also have a portfolio that we can view online, and blog-writing experience (and following) would be a definite plus. If you know anyone who might be interested in this adventure of a lifetime, please have them email ASAP at info@canvas.ph. wow.. lovely looking strawberries ! I thought strawberries only grow in temperate countries and never in Pinas :) Very fresh , organic looking indeed. How much is strawberry per kilo?